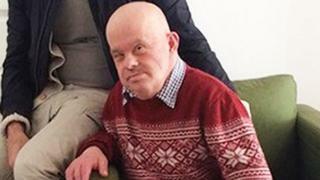 A man with Down's syndrome died in hospital after staff failed to feed him properly for 19 days, an inquest heard. Giuseppe Ulleri, 61, died from pneumonia in 2016 after struggling to ingest food given through a tube at Manchester Royal Infirmary (MRI). Failure to provide nutrition and treating him while on his back contributed to his death, a jury at Manchester Coroner's Court concluded. The trust that runs MRI said its care "fell well below our standards". Mr Ulleri, from Withington, who was known as Joe to his family, was said to have been very active. He had been looked after in a care home since 2013 but was found on his bedroom floor on 26 February 2016 by staff, the court heard. The jury was told scans at MRI did not show any significant injuries, but subsequent X-rays revealed fractures to his neck, hip and wrist. For medical reasons, he was made "nil by mouth" and had a feeding tube inserted on 9 March, but it was removed a day later as he found it uncomfortable, the coroner said. She said he had "long periods" with "no nutritional support" and for a long time the "only nutrition he had was... when the tube was in place." He said he told staff the 61-year-old's condition was deteriorating due to lack of nutrition, telling them: "Why the delay? He could die from this." He said the delay in giving nutrition meant his brother was too weak to recover from the procedure and he died two days later. His weight had fallen from about 8 stone 11lb (56kg) to 6 stone 13lb (44kg), the court heard. The jury of six men and five women concluded that "failures in overall care", consisting of "failure to provide nutrition" and nursing him "in a supine position" contributed to the fatal lung infection. Following the inquest, Mr Ulleri's family released a statement that said: "Our brother was the kindest and gentlest soul yet he was allowed to die in the most horrendous way. "Joe's case needs to be a catalyst for change. "The NHS and society as a whole needs to learn from Joe's death to ensure nobody else with learning disability suffers in the same way that he did." Manchester University NHS Foundation Trust apologised and said it has implemented "measures to ensure that this does not happen again". The trust said it has "undertaken extensive work on nutrition and hydration" and "focused on how we care for our patients who have a learning disability".